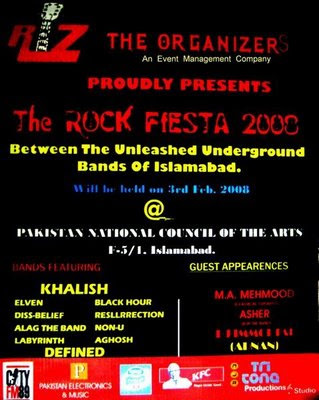 THE ROCK FIESTA 2008 - Battle Of The Bands is on 3rd February in Islamabad. Alag The Band will be rocking it out LIVE at the Rock Fiesta 2008 - Battle Of The Bands.Ten bands are performing there and each band will perform 3 songs. Entry will be closed at 3:00 pm so be sure to you reach there at the right time. Sponsors: City FM89 , Pakistan Electronix and Muzik , Nestle , KFC , Tri Tone productions and studio.